According to data from Eurostat, in 2010, total waste production in Europe amounted 2.5 billions of tons, from which only 36 % was reused or recycled. The current European legislation aims at improving waste management and intends to stimulate recycling, reduce landfill disposal and change consumer behavior, with the aim to reach a residual waste close to zero. Turning waste into a resource is key to the circular economy. Bio-based plastics have found wider acceptance in the industry because they lead to the reduction of greenhouse emission and reduce the dependence on crude oil, however the concern for the use of raw materials competing with the food have increased. This fact has attracted a great attention over the concept of food waste valorisation as alternative source for plastic industry. In general, vegetal residues contain a considerable amount of compounds with significant potential for use as a source of renewable raw materials, which open a new way to plastic manufacturers. Legume processing in particular generates large amounts of by-products, for which no economically viable and effective treatment process exists to date. 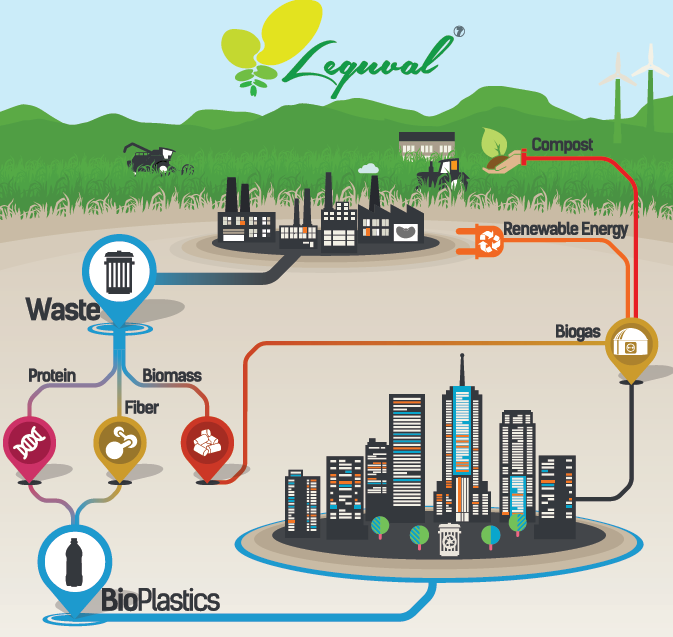 In this context, the international project LEGUVAL is developing solutions for the valorization of by-products from the legume processing industry, to be used for plastic production. The project focuses on the extraction of the protein fraction from processed legumes, to be used as new raw materials to develop new biodegradable coatings and plastics. The leftover biomass of protein extraction could be used as a filler in polymer matrix, to improve the properties of plastic materials and as a substrate for biogas by anaerobic digestion. The project is carried out by an international consortium of eleven partners including research organizations, industry associations and companies. During the two first years researchers have evaluated by-products from different legumes (peas, lentils, soybeans, chickpeas, beans, faba beans and green beans) as raw materials for proteins and fibers extraction. 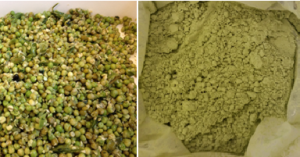 Pea by-products were selected as starting materials and an innovative, environmentally friendly method was developed, to extract proteins from those by-products with a purity degree close to 80%. The protein rich fraction was then used to produce coating for plastics films, with the aim of improving the barrier properties of current bioplastics. The application of new coating on top of biodegradable plastics such as PLA have allowed to reduce oxygen permeability by up to 18 times which opens new fields for application. It is planned to scale up the process and produce new completely biodegradable packaging materials with improved barrier properties in a later stage of the project. Plastic films and plant pots were produced with standard extrusion and injection molding technology respectively, to show the feasibility of LEGUVAL materials. Moreover, the leftover biomass is being employed as additive for the preparation of composites which has been successfully produced on kilogram scale on extruder and has been tested for film production. Production of flat films of protein based plastic (left) and biodegradable pots based on legume proteins (right). Additionally, the residual biomass from protein extraction has been evaluated as source of biogas. In particular the potential of pre-treated lentils, peas, green beans and beans was studied and compared with virgin by-products. In general, higher gas production was achieved by by-products after the extraction treatment. Results showed a total cumulative biogas productions and a biogas composition comparable with values reported for the most common biomasses and organic wastes. Further studies will be developed along last half year of the project to validate the results at industrial scale. 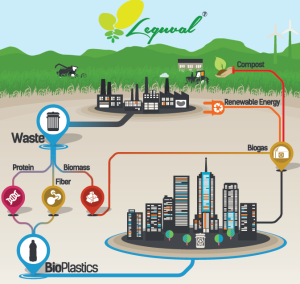 In general, LEGUVAL project is expected to have a very positive impact on the plastic industry as well as final users since it will result in new bio based materials, renewable, compostable with improved barrier properties and not food competitive.